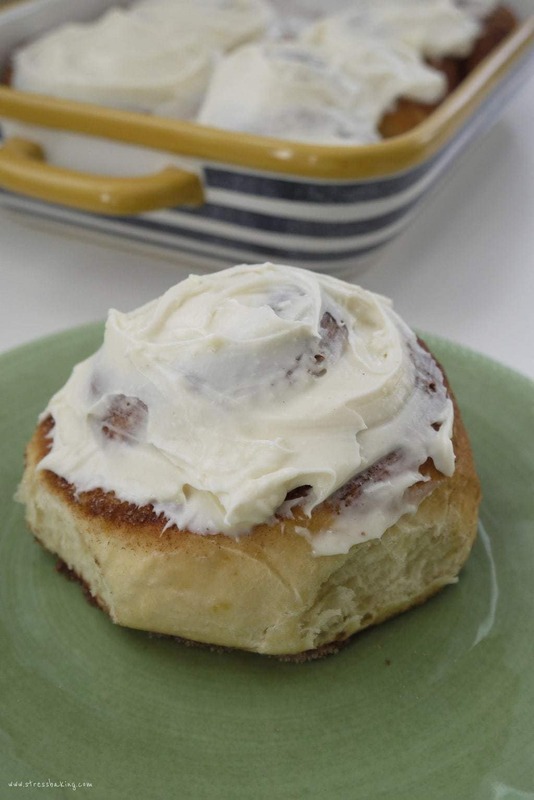 These gigantic, fluffy cinnamon rolls topped with creamy, rich cream cheese icing are the perfect Cinnabon clone. 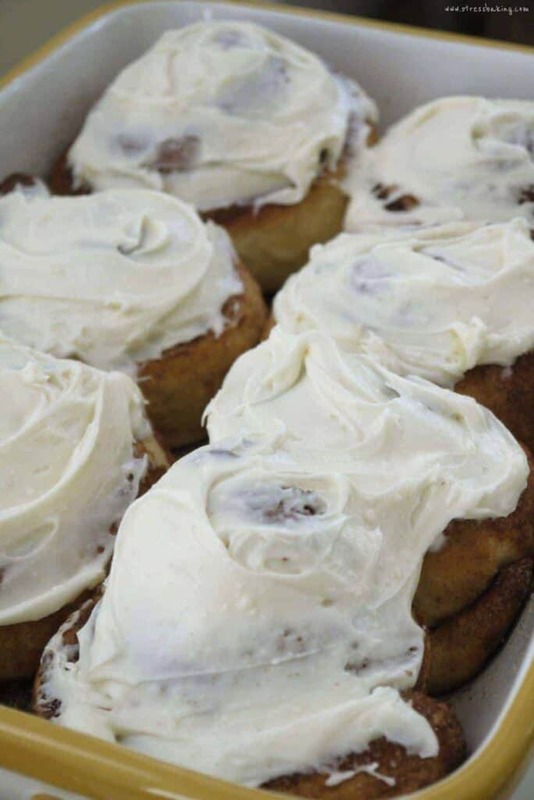 These cinnamon rolls are not for the light of heart. They are massive and are 100% not diet friendly. They are big enough that I could hide a small child inside of them and people would be none the wiser*. And just calling these “cinnamon rolls” wasn’t going to do them justice. Gigantic Cinnamon Rolls? Meh. Enormous Cinnamon Rolls? Doesn’t really roll off the tongue. The only name that seemed fitting was Colossal Cinnamon Rolls. 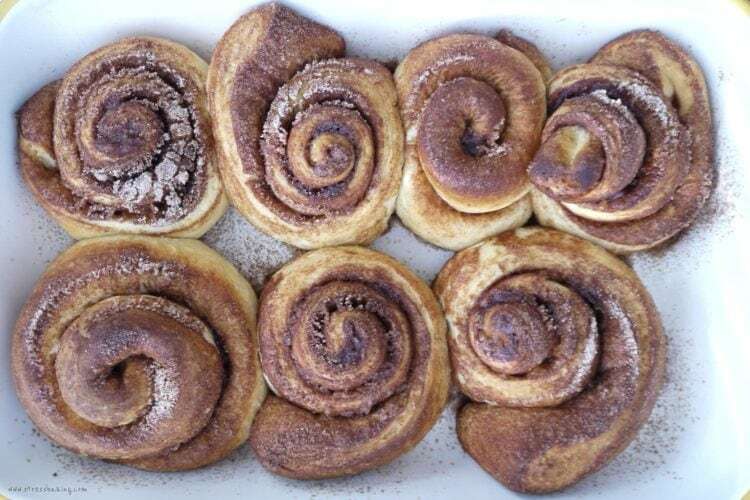 There’s a restaurant in Cape Elizabeth, Maine called The Good Table that makes cinnamon buns fresh on the weekends that are the size of your head. They’re so big, in fact, that they suggest you share it with at least one friend. That’s right – they’re a meal for two people. And every time I’m in town, I have to stop there for brunch to pick one up and I’m reminded of how badly I want to be able to make them myself back in Massachusetts. I’ve driven the 2.5 hours each way early on a weekend morning just to get one of those things. They’re that good. My goal was to make the biggest cinnamon rolls I could, short of injecting them with growth hormones that would turn them into walking, talking, mutant, city-destroying baked goods. I wanted them to be wide and fluffy, with tall spires that the icing can pour down like snow on a mountain’s peak. It’s taken me about a year to get it right and now they’re perfect. Perfect, I tell you. You may think there isn’t a difference between the store brand flours and premium brands, but I’ll tell you right now – there is. I’ve done quite a bit of trial and error, and hands down King Arthur Flour has produced the best and most consistent results for my recipes. I started using them when I lived in Vermont because they were local, and I got hooked. I used their unbleached all-purpose flour for the rolls this time around, but I’ve used their whole wheat flour as well with fantastic results. Highly recommend spending a little more for a better end result. I also used my new favorite Cabot Cream Cheese for the mouth watering icing. I mean, you’re ingesting this stuff – don’t you want it to taste as good as it can? Of course you do! I like my cinnamon rolls to look like nautiluses – huge, imperfect spirals that I can peel apart as I eat them in one long coil. I still do that with these, but be warned – you’ll make less of a mess if you use a fork and knife. I’ve eaten these with icing, without icing, with only a drizzle of icing… they’re all amazing. As long as you reheat them, they taste like they’re fresh out of the oven. Every time I open the cake stand I store them in, a reminiscent feeling of teenage bliss washes over me. The smell reminds me of walking through the mall while I try my damnedest to resist the urge to run, arms flailing toward Cinnabon, leaving only a pile of drool in my wake. It’s hard to put my love for Cinnabon into words. I started to type it out, but it got pretty lengthy and borderline inappropriate. So I’ll just leave it as this: I LOVE CINNABON. But let’s be honest here. Cinnabon cinnamon rolls are the furthest thing from healthy. There is no way to eat one of these every day without ending up with some pretty serious health issues. So how do I justify eating them anytime I want? By making them myself, where I can control the contents and possibly prevent myself from a massive coronary at 30. And also by eating an egg occasionally, instead of shoving icing covered cinnamon sugary dough in my face every single day. Health concerns aside, these are phenomenal. 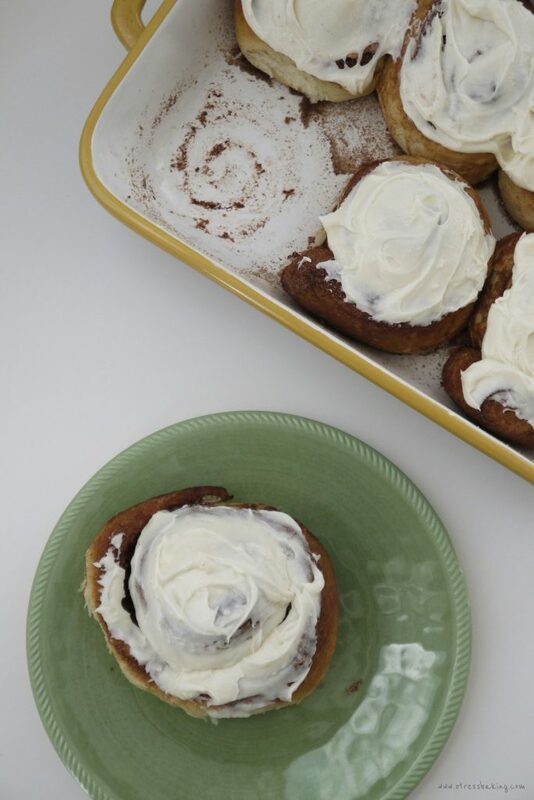 They’re huge, and soft, and fluffy, and packed with cinnamon sugar, and the icing… oh, the icing. It took me a year to find the right balance of butter and cream cheese for the icing. And even when I thought I had it right, something was missing – so I kept starting over and going back to drawing board. Recently I had a Cinnabon cinnamon roll and what I had been missing smacked me in the face – lemon juice. All this time, it was less than a teaspoon of lemon juice that was eluding me. Let me tell you – stuff like that makes me joyous and incredibly frustrated at the same time… but mostly joyous. Don’t be afraid of yeast! I used to be, and then I realized it’s not hard to make yeast your new best friend. Just show it who the boss is and you’ll have no trouble at all. This recipe only needs one rise, and you just mix the yeast right in with the dry ingredients – no combining with water and measuring the temperature to get it exactly right. This is as easy as it gets. 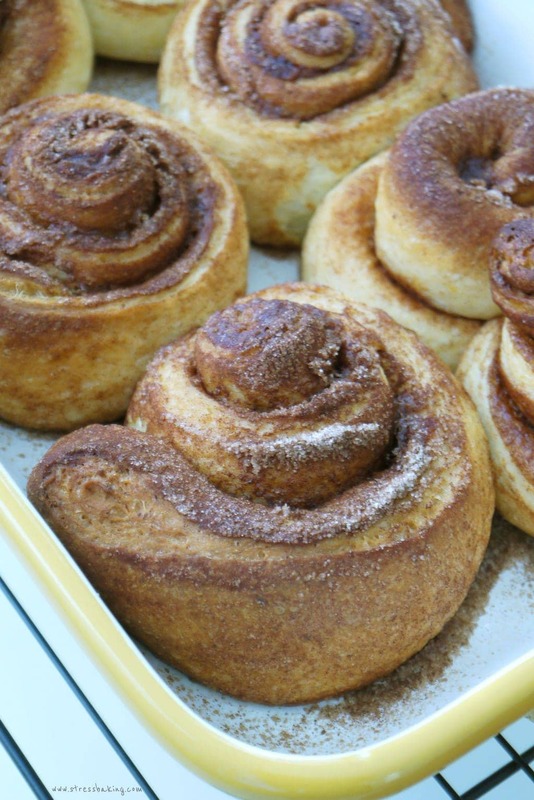 No excuses, my friends – go make these and enjoy your house smelling like cinnamon-y sugar-y joy. In a large bowl, whisk together 2 cups of flour, yeast, sugar and salt. Set aside. In a medium sized microwave safe bowl, combine water, milk and butter. Heat until butter is melted, give it a light stir to combine. Add egg and the butter mixture to the flour mixture and stir to combine. Add remaining 1/2 cup flour until dough is easy to handle. Prepare a lightly floured surface and knead the dough for about 5 minutes. Place in a greased bowl (butter or non-stick spray works) and let rest for 15-20 minutes. Roll out dough onto parchment or wax paper into a 15×9″ rectangle. It doesn’t need to be perfect, just rectangle-ish. Spread the softened butter on top of the dough, all the way to each edge. 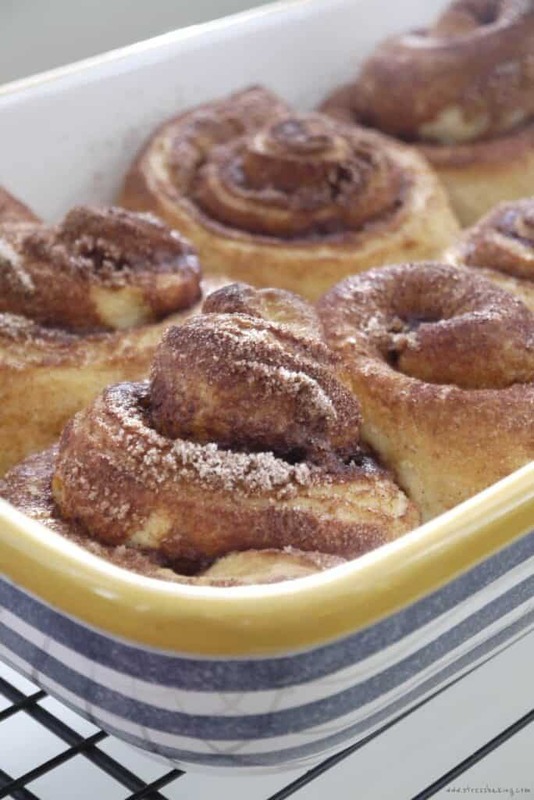 In a small bowl, combine sugar and cinnamon until cinnamon is evenly distributed. Pour/sprinkle cinnamon sugar mixture on top of butter to evenly coat dough. Beginning at the 9″ side, roll up the dough tightly. Cut into 6 pieces and place an inch apart into a prepared 9×13″ baking dish (covered in non-stick spray). Before you lay each roll in the pan, gently press up on the center of each roll from the bottom to give them the oh-so-desirable spire. Set them in the pan so each roll is touching the ones around it – you want to give them some room to rise, so don’t squish them TOO much up against each other! Preheat your oven to 175°F and then turn it off. Loosely cover the dish with aluminum foil or plastic wrap and place inside the oven for 60 minutes. The rolls will double in size after about an hour, but you can leave them in longer if you feel they’re not quite risen enough. Remove dish from oven and preheat oven to 375°. Bake for 25 minutes until the tops are lightly browned. If you prefer yours lighter, just cover with aluminum foil halfway through the baking time. Let sit in pan for 5 minutes, then move to wire rack to cool completely. In a large mixing bowl, cream together cream cheese and butter on high speed. Add powdered sugar, vanilla extract, lemon juice and salt. Whip on high speed until fluffy. 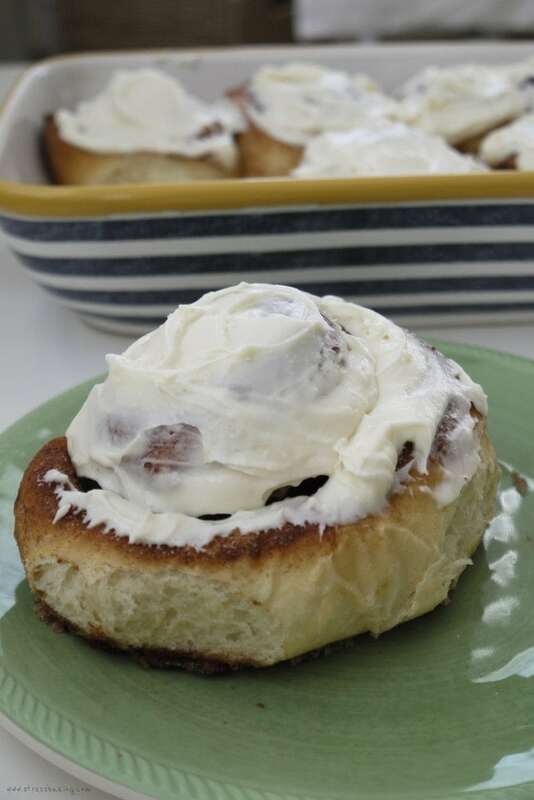 Slather icing onto rolls and enjoy! Tip #1: If you want a double layer of icing, frost them with icing while they’re still warm, let the rolls cool, and then add a second layer of icing. Tip #2: If you’re making them ahead of time to be reheated later (in which they still taste absolutely amazing, by the way), just wait for the rolls to cool completely before icing. Then pop them in the microwave for 30-45 seconds so that they’re warm and the icing gets smooth and melty, and you’ll have the perfect drool-worthy treat! *This might be slightly exaggerated. *Disclaimer: King Arthur Flour and Cabot have no idea who I am. I’m just a fan! In your recipe you listed 1 tsp of salt as an ingredient but forgot to mention it in the the recipe. I forgot to put it in so mine were a little too sweet. Also, for the filling, even though it is common sense, you didn’t mention to spread the cinnamon mixture on the dough after the butter. I did do that. They came out very tasty but a little dry and not as fluffy as I thought they would be. I think my pan was too big so they spread out too much. No worries gonna try again. Thank you, Robin! That’s what I get for copying and pasting from one widget to another and not triple checking my work. I really appreciate you letting me know! And I agree, the pan may have been too big – you definitely want to squish the rolls up next to each other. Definitely do try it again and I hope it works out better next time!